The software allows for automated batch processing in high throughput sequencing projects such as for typing and surveillance. Full IUPAC code support for consensus sequence determination and automated contig trimming is included. Manual cleanup of the assemblies – if needed – is facilitated by the interactive assembly reports. 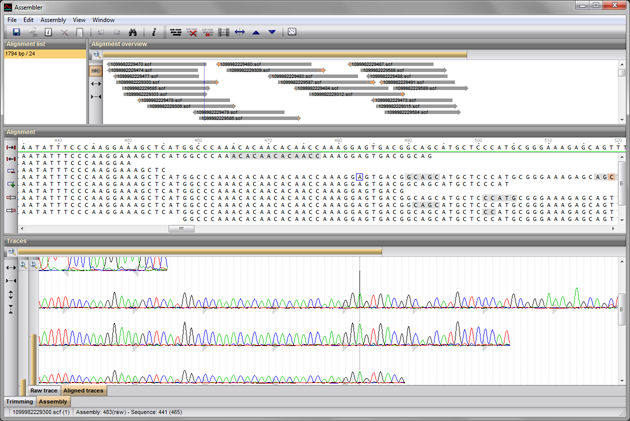 Complete gene assembly projects with aligned chromatograms can be saved into projects and popped up with a single mouse click on a sequence stored in the BioNumerics database.